The process involves an exploration of any conflicts and challenges you may be facing. Life is always lived from the inside out. We all live our lives in the direction of our most dominant thoughts. When you feel unsure about why things are the way they are, or what you want in life you will only produce average results at best, and more likely continue to experience frustration, sadness, depression and many other negative emotions that steal your energy, slow down your motivation and delay your success. Together, we will reframe these as the necessary energy and information that people need to pay attention to their uniqueness and their personal blueprint. Every person’s blueprint also contains solutions on how to heal the mind and body and how to grow into their full potential as individuals. You will learn new strategies and tools to communicate more effectively with your own thoughts, feelings, actions and your body’s bio-feedback mechanisms (such as your intuition, gut reactions and inner sense). These communication skills need to be practiced regularly and are a powerful tool, helping you to navigate through life’s most difficult circumstances. Helping you to achieve a lasting change is my commitment. 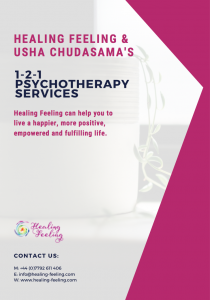 I am trained in a wide range of therapies and can therefore adapt and integrate a combination of approaches to suit your needs for effective lasting change. I would be honoured to help you through any challenges you face and enable you to make lasting change. Please get in touch and we can discuss your needs. Education is the essential tool to feel empowered. When you understand the factors that are contributing to your challenge(s), it becomes easier to take action and move on to improving your life. Having choice is important. We are often stuck because it is the way we have always known. I strive to give alternative strategies to empower you to discover solutions that come from you and your innate inner wisdom. With these new strategies, it can take a while to adapt. I will be there to support you during any change and guide you through any issues you may have. At your pace, I integrate life coaching, counselling & psychotherapy for a speedy, effective and change. Clients comment on how quickly they notice a difference with something they have held onto for their whole lives after working with me for just a few sessions.